What, Exactly, Is an Interventional Radiologist? During my training as an interventional radiologist, my family, patients and colleagues in other specialties would ask me exactly what it was that I did. Only after training another six years after medical school, I’ve come to realize that the answer is far more complex than the question would imply. In the simplest of terms, interventional radiologists use cutting-edge imaging equipment to perform minimally invasive procedures. We are part radiologist because we must interpret imaging studies like X-ray, computed tomography (CT) and ultrasound to diagnose abnormalities inside patients. But we are also part surgeon (or more aptly coined “interventionalists”), as we use this imaging to guide a combination of needles, wires and catheters to treat these abnormalities. About this time last year, I wrote a piece about what to consider when choosing a specialty. Now that I've gone through most of the core clerkships, I have a better idea of what my interests are and the aspects of my future career that I want to prioritize. After many, many long hours of careful consideration, I've chosen interventional radiology. What is the typical day in IR? ​ Interventional radiologists usually arrive at the hospital between 7 and 8 am. They round on inpatients and review the day’s scheduled procedures before the first case. The workday primarily consists of performing procedures in an angiography suite using x-ray guidance. Some procedures are done with CT guidance or using ultrasound only. In private practice the average interventional radiologist will perform about a dozen cases in a day. The workday runs until 5 or 6 pm. In between cases interventional radiologists will dictate procedure (postop) notes, perform inpatient consultations, and sometimes also read diagnostic films (x-rays, CT scans, MRI scans, etc.). Clinic schedules vary by practice. Most practices have 1 day of traditional clinic hours scheduled per week. Additionally, interventional radiologists sometimes have clinic visits scheduled in between procedures. Overall, the ratio of procedure or operating time to clinic time is greater in IR than in most surgical fields. What do interventional radiologists see in clinic? Just like surgeons, interventional radiologists see patients for pre-procedure consultations and post-procedure follow-ups. The spectrum of diseases treated by IR is extremely broad – everything from cancer to vascular malformations to peripheral arterial disease to women's health. What is IR call like? Call frequency is proportional to the size of your group. The more partners you work with, the fewer call nights you will take each month. Groups can range from just two physicians to over a dozen interventional radiologists. All interventional radiologists, including residents and fellows, take home call. Interventional radiology plays a critical role in managing very sick patients on call. Urgent or emergent cases can include acute bleeding (gastrointestinal bleeding, hemoptysis, trauma), drain placement (acute cholecystitis, obstructed kidney, abscesses), and stroke therapy among many others. Are there “turf battles” with other specialties? In short, the answer is yes. But this is not unique to interventional radiology. There are turf battles between otolaryngologists, plastic surgeons, ophthalmologists (oculoplastics) and oral and maxillofacial surgeons when it comes to cosmetic surgery. Both neurosurgeons and orthopaedic surgeons compete for spine surgery cases. What is the common theme in all these examples? The procedures are interesting and lucrative. Interventional radiologists occasionally have turf battles with vascular surgeons over the management of peripheral arterial disease. Once in a while you may even hear a cantankerous surgeon say: “You shouldn’t do endovascular interventions if you can’t perform open surgery.” I often counter that if this were the case, then there would be no interventional cardiology (cardiothoracic surgeons would be doing heart catheterizations), and gastroenterologists wouldn’t be performing endoscopy (colorectal surgeons would be doing all the colonoscopies). Besides… interventional radiology INVENTED these procedures! There’s no denying that as a medical student, diagnostic radiology is not a particularly fun rotation. You sit in a dark room looking over the shoulder of someone who is scrolling through CT images at a mile a minute pace. It’s easy to imagine getting bored. But nothing could be further from the truth. The analogy I like to give is that it’s not much fun to watch someone else play a video game - especially when you're not familiar with the objectives of the game. It is infinitely more fun to read a study and be in control of the mouse than to watch someone else do it. Once you train your eyes and mind to read a CT study, you simply see things that non-radiologists cannot, and the work becomes immensely fascinating. And if you worry you may fall asleep working in the dark, just ask yourself how often you fall asleep waching a movie at a movie theater. Diagnostic radiologists certainly don’t have the degree of patient interaction that a family practitioner does, but, at the same time, they aren’t in total isolation. For example, diagnostic radiologists interact with patients in mammography – counseling them and performing diagnostic procedures. Musculoskeletal radiologists perform arthrograms prior to interpreting MRI scans of the joints. And, of course, interventional radiologists have extensive patient contact just like any surgeon, cardiologist, etc. Another oft-overlooked aspect of diagnostic radiology is that you are able to impact the care of more patients than most other clinicians. An emergency medicine physician may see 20 patients during a 10 hour shift. During that same period, a diagnostic radiologist will have read imaging studies on 80 different patients. They will have seen the same pathology and impacted the care of as many patients as four emergency medicine physicians combined! Would you prefer to achieve mastery of primary care (internal medicine) en route to becoming a cardiologist or gastroenterologist? 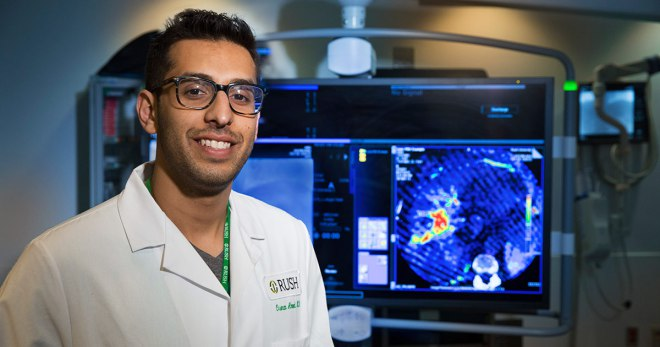 Would you rather achieve mastery of all imaging modalities (x-ray, CT, ultrasound, MRI, nuclear medicine) en route to becoming an interventional radiologist? IR was the most competitive residency in the 2017, 2018, and 2019 Match. What do program directors look for? Because it can be difficult to compare transcripts from different medical schools, many program directors place considerable emphasis on USMLE Step scores. Medical school transcripts are scrutinized, though greater emphasis is usually placed on performance during 3rd year clinical clerkships. A strong research background can also help students stand out. What board scores are necessary to secure an IR/DR residency position? The mean Step 1 score of US Matched Applicants was 246 in 2018. Step 2 scores can help an applicant if they are substantially higher than the Step 1 score. The mean Step 2 CK score of US Matched Applicants was 255 in 2018. Research that leads to peer-reviewed publications or presentations demonstrates that a candidate understands the scientific method, and has experience in compiling data and synthesizing it into a clinically meaningful conclusion. Additionally, research that is relevant to radiology and/or interventional radiology demonstrates a genuine interest and commitment to the specialty. US seniors who matched into diagnostic radiology have an average of 2.8 research experiences and 3.9 publications (data for IR/DR is not available at the time of this writing). Should applicants do away rotations? Away rotations can be a great opportunity to audition for a program that you are really interested in. But you must be prepared to perform at your best.